Let's get one thing straight up front: I'm really enjoying Dishonored so far. I don't mean "Yeah...it's a good way to pass the time" enjoying it; I'm talking about "I can't stop mentally playing the game while I'm at work," enjoying it. It's definitely going to factor into game of the year discussions come December. Now, with that disclaimer out of the way, let me tell you about something that really irks me about the game: fire breathing thugs. They're low level bad guys, they swill alcohol and then light it on fire to attack, and I find them annoying as hell. The funny thing is, I'm self-aware enough to know that it's actually ridiculous to be irritated by these guys. The first time I got caught up in one of their fireballs, I remember thinking: "Well, that's a bit of a stretch." Yes, that's right: in a game in which you literally teleport, inhabit rats' bodies, and commune with a supernatural deity, I had the audacity to criticize something that actually happens in the real world as unrealistic. Maybe this comes from my knowledge of fire safety and my faith in the competence of your average underling. If college taught me anything, it's that alcohol and fire definitely mix, but almost never in the way you expect (or intend). The fact that low-level cronies seem to be crude pyromancers is also a bit weird in the context of the world. I haven't finished the game yet, but their ability to spit flames is almost supernatural thus making them weirdly similar to Corvo (the character you control), who seems to be one of the very few people wielding magic. Of course, there are great mechanical reasons for giving thugs this attack. It gives them a ranged combat option, which makes battles more dynamic. 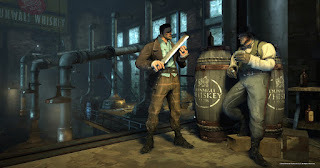 The whiskey bottle has a different profile from other ranged weapons, which serves as both a surprise and a constant reminder to pay attention to your opponent's tools before and during fights. Logically, getting toasted depletes a large amount of health, which means a seemingly simple fight can quickly become catastrophic if you're sloppy about it. The fire breathers are as much a teaching tool as they are a simple opponent. Ultimately, this is probably the real reason I resent them: they have the uncanny ability to make me look very dumb, very fast. They're low-level baddies who would usually be cannon fodder in other games, but in this game they can (and do) embarrass me unexpectedly. Dishonored can make me feel like a master assassin, but a momentary lapse in judgment turns me into a scorched buffoon. I have the sneaking suspicion that the disbelief I harbor towards the fire breathing thugs is mostly misplaced frustration. In a world in which I stalk my enemies by seeing through walls, is it really so ludicrous that belligerent drunks can breathe fire on command? I doubt it. Is it more believable that I resent the ability of characters that are essentially the equivalent of Star Trek red shirts to completely ruin my power fantasy? Probably. But you'll never get me to admit it. The thug fire-breathing ability is completely broken. It's one of the single reasons I'm finding Dishonored to lean towards to mediocre side than some decent stealth adventure. The fire-breathing ability is more powerful than anything the actual military-trained enemies can throw at you. If I see a room with 10 guards all hunting for Corvo, I know I can take them out as long as I am careful. In a room with 10 thugs, I'll have to kill several thugs from a distance with ranged weapons because you can't risk engaging them with a blade. The fire breathing ability is just too strong, and it only gets more stupid when you play it on higher difficulties. The booze drinkers become the greatest threat the world has ever known. Agreed. It is very broken. There is little difference in the animation to indicate they are about to use a fire attack instead of a sword lunge, and there's no way to block it; all you can do is teleport behind them but the damage from the fire is instant so it's almost impossible to move out of the way by the time you realize that's what they're doing. Plus they can do it numerous times, which adds to the ridiculousness because they'll sit there using it over and over.